It is difficult to find something new to write about Ginkgo, possibly the most well know of all tree species. 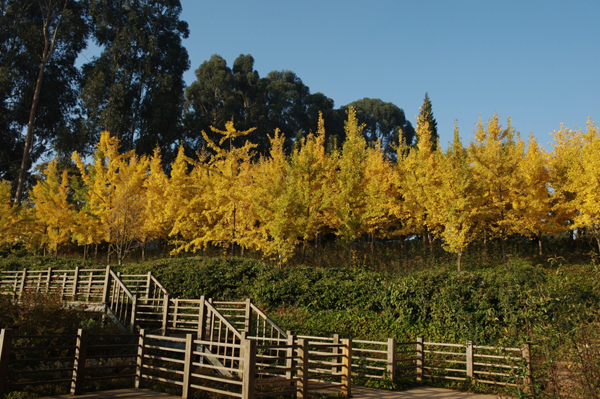 It is indeed a beautiful tree, especially in the months of November and December in Kunming Botanical Garden where a large group of juvenile specimens grow with vigor on the upper slopes of the Foliage and Fruit Garden. At this time of year, the trees are ablaze with a rich golden autumn color. When viewed against the backdrop of Kunming’s azure blue autumnal skies, the scene is a vibrant reminder that we will soon be experiencing the onset of winter. Ginkgo is a living fossil and its paleontology has been much researched, with recognizable evidence dating back at least 270 million years. Previously, Ginkgo was widespread throughout the world but is now a monotypic genus with a single species, restricted to two small areas in Zhejiang Province of Eastern China. Whether or not this population is actually of natural origin has posed much discussion. What is known is the long history of Ginkgo cultivation throughout much of China and, over the last two hundred years or so, in many other parts of the world. Ginkgo is a remarkably easy tree to cultivate and grows happily in a wide range of habitats, climate types and soil conditions. It demonstrates many characteristics of a pioneer plant, particularly through an ability to colonize disturbed areas and its ease of vegetative reproduction. It is not entirely happy in shady conditions, preferring a more open aspect. As an ancient land plant, Ginkgo has developed tremendous resistance to pest and disease and is a very long lived tree, with some specimens exceeding 2000 years in age. Ginkgo biloba is dioecious, producing male and female trees. Most of the trees atop the Foliage and Fruit Garden appear to be male. There is a particularly prolific female specimen close to the entrance of the East Garden that produces an abundant annual crop of malodorous fruit. 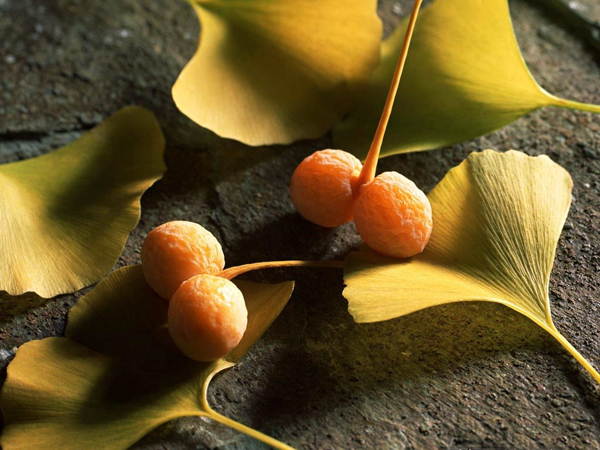 The culinary and medicinal uses of Ginkgo are well known and equally well researched. The most commonly applied English name given to Ginkgo is the ‘Maidenhair Tree’. This name is given simply because the leaves resemble the pinnae of Adiantum capillus-vernis, the maidenhair fern. The specific epithet, biloba is derived from the latin bi ‘two’ and loba ‘lobed’, referring of course to the distinctive and unique shape of the leaves. I hope you have an opportunity to visit the Foliage and Fruit Garden of Kunming Botanical Garden and enjoy the late foliage color of this, the most Chinese of China’s trees.